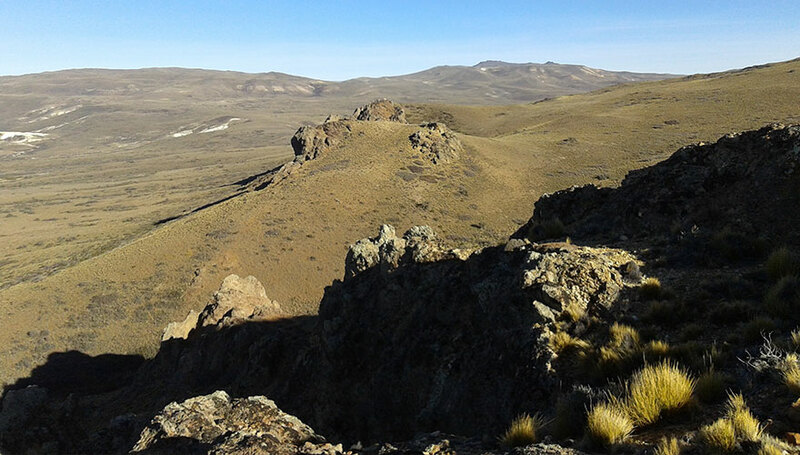 Los Toldos comprises 20 contiguous properties for a total of 57,000 ha located in the central north of the Deseado Massif, Santa Cruz Province, Argentina. Topography in the project area is subdued with absolute elevations of approximately 600 m amsl (above mean sea level) with a cool, dry continental climate. The project is readily accessible by regional gravel roads. The stratigraphy at Los Toldos comprises a gently dipping sequence of felsic pyroclastic rocks of the prospective Jurassic Age Chon Aike Formation, overlain by finely bedded siliceous sediments of the La Matilde Formation, which are in parts masked by flat lying Cretaceous aged continental sediments and Quaternary basalts. Al Amanecer: Located approximately 22 km NNW of El Bagual on what is interpreted to be the same regional structural corridor. Subvertical gold-silver bearing epithermal quartz veins and tabular breccia bodies containing vein quartz clasts hosted by silicified crystal rich tuffs of the Jurassic Chon Aike Formation. Extremely high concentrations of pathfinder elements such as As-Hg-Sb-Tl reported. Other prospects yet to be assessed include La Suerte and La Batalla. 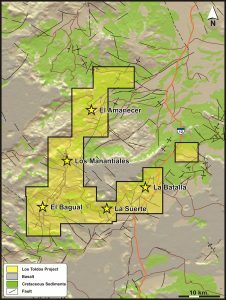 El Bagual Prospect: Barrick Gold Corporation identified the prospect on the basis of an alteration anomaly associated with a regional lineament and a circular topographic feature, and commenced exploration during 2002. Systematic geochemistry and geophysics were conducted between 2003 and 2005, culminating in the drilling of five diamond drill holes for 551.5 m. Owing to various factors, none of the holes was successfully completed and the best result reported was 104.5 m at 0.42 ppm gold from 80.2 m to the end of hole. The hole was abandoned at 184.6 m, well short of design depth of 300 m. The drilling by Barrick did not effectively test the target. Rock chip and sawn channel sampling have reported values up to 6.55 ppm Au. Patagonia Gold S.A acquired the project from Barrick during 2007. El Amanecer: To date only geological mapping and surface sampling have been conducted at the prospect. Rock chip samples have reported up to 5.76 ppm gold and also very high pathfinder element concentrations; As, >10,000 ppm, Hg, 81.6 ppm, Sb, 738 ppm and Tl, 505 ppm. Low-sulfidation epithermal gold +/- silver mineralisation. At El Bagual a zone of auriferous veinlets approximately 100 m wide that have never been effectively tested with drilling. A structural corridor approximately 40 km long with only five ineffective drill holes.